Something I’d been thinking about for quite some time (like years!) before this winter’s prolonged cold spell sent me researching seriously and posting some questions to the UKC Forums. 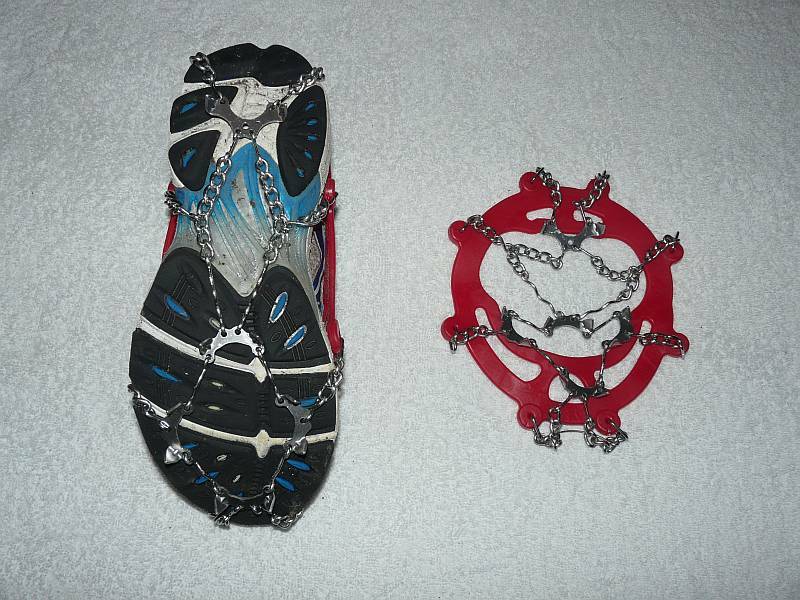 Which saw my initial list (based on Needle Sports’ stock) of Kahtoola MICROspikes & KTS, Charlet Moser Spikys and Grivel Spiders augmented by recommendations/suggestions for Yaktrax and various types of studded/spiked shoes. 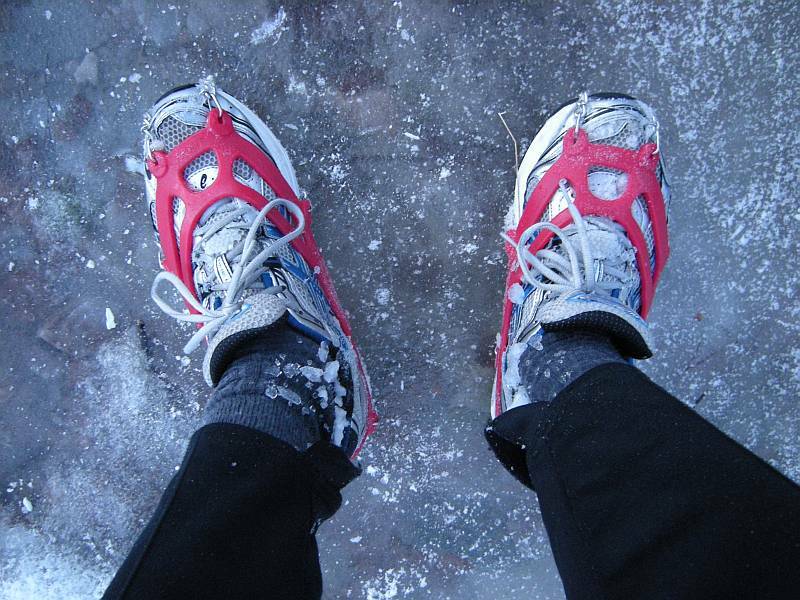 And (to cut a long story short) resulted in me picking up a pair of locally-available Spiders from The Ice Factor to try while ordering a pair of MICROspikes online as well. To which I might just add that I did the straps up once (snugly but not over-tight because I was needlessly concerned about creating circulation cold spots) and left them, but never had any problem with the things moving. While they seemed to rotate slightly to find their natural position (aligned with the inside edges of my soles and the inside back spikes maybe toed in a touch), they really did stay put at that (on my running shoes anyway) and let me just run. And made a reassuring and satisfyingly ‘crampony’ crunch on the crispest/iciest stuff, which certainly would have had me flat on my back or picking my way at a snail’s pace without them! Got my MICROspikes today, so had to head out for another run (this time an 8-mile round trip to Tigh-na-sleubhaich in the Lairig Mor) to try them out. Which gave me the chance to run on everything from ribbons of pure ice (where the bottom end of the path forms a natural drainage line) through following existing footsteps in the softer snow to chasing down more compacted Landrover tire tracks on the west (Fort William) side of the highest point. And they did it all as well or better than the Spiders, with the most obvious differences being the ease of fitting with that strapless/buckleless design and the added (possibly partly psychological?) confidence stemming from the more extended spike pattern. Apart from that, both Spiders and MICROspikes benefit from spikes of just the right length, meaning long enough to bite but not long enough to cramp your running style or ball up in softer stuff, which also means you can just fit and forget unless you’re taking them off for obvious stretches of bare ground. Where the Spiders clearly score is in being lighter (NB light enough to carry as emergency spares! ), cheaper and ‘one-size-fits-all’, with the MICROspikes (still pretty light!) getting the nod for the brilliant ‘harness’ and more crampon-like performance (think I’d be happy to run over many real hills in these). While the elastomer harness was softer than I expected, it seems to be pretty durable by all accounts and could obviously be patched on the hill with a length of shockcord or similar if any of the eyes did go. So they’re looking pretty well perfect for my needs if their durability matches their functionality! The Spiders are ‘handed’ (left and right), but apparently just to keep the buckles to the outside of the feet because they’re basically symmetrical apart from the threading of the straps. It’s worth pulling the retainers for the strap ends down away from the buckles before doing them up. My Spiders weigh 166 grams the pair (against Grivel’s quoted 140), with the carrying pouch adding another 12. 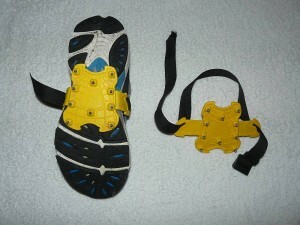 The MICROspikes are not handed, but still have an obvious front and back. My large MICROspikes weigh 412 grams the pair (where Kahtoola quote 280 to 411, depending on size). While all the positive reviews helped, a late look at Kahtoola’s MICROspike fitting video was virtually enough on its own to convince me to buy! I carried both Spiders and MICROspikes again today with the hope of further testing, but needed neither for miles of mostly virgin powder snow to the far end of Loch Eilde Beag before finally fitting the MICROspikes (and still being happy with them) for the return over the icy An Cumhann path and big descent to the village. While a true crampon like the Kahtoola KTS should be better for true hill work, the shorter spikes (nothing you’re likely to catch and trip over there!) of the MICROspikes and Spiders seem more attuned to running. So, while I might yet give the steel KTS a whirl some day (ruling out the aluminium where contact with rock is basically unavoidable) if the MICROspikes get trashed too quickly on my habitual rocky trails and paths, I’m pretty happy with what I’ve got pending longer-term trials. To explain quite simply, I ran every step of the way with no walking or stops whatsoever. While I’ve more than once run the whole way back up the short, steep (Glen Coe) side and down the long (Kinlochleven) side, today I ran all the way up the long side (where I usually let myself walk for a few steps above the Penstock) and down to Glen Coe, just touching one of the roadside marker posts where I’d normally take a quick standing break and heading straight back up. So perhaps I was suffering by the time I hit the zigzags towards the top, but kept it together through a real mind-over-matter head game and shuffling jog to the twin cairns, after which I knew I was home dry (except that it rained, but you know what I mean?) and running more freely again.